Fort Collins is a city that understands the value of a good plan. A well made plan gathers consensus, envisions a better future, and leverages private development in order to achieve the greatest positive benefit possible for the largest number of residents. And right now the City is working on two plans: the Downtown Plan and the Old Town Neighborhoods Plan. Because these two plans encompass the bulk of historic Fort Collins, they are being completed concurrently with their final stage taking place in February when they will go before City Council for approval. 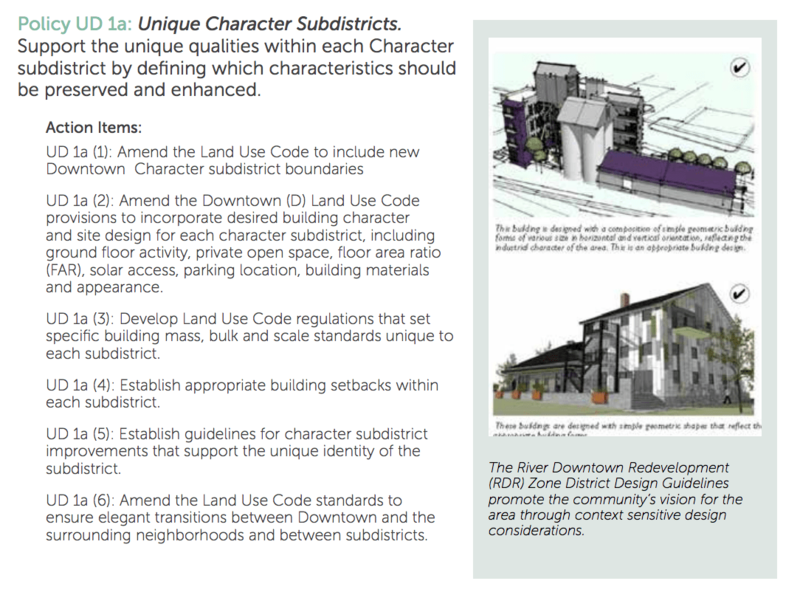 The Downtown Plan is a 250 page document (so far… in its draft form…). It covers a far larger area than most people think of when they envision “downtown” and it comes at the topic of planning from multiple angles: urban design, transportation + parking, market + economy, arts + culture, energy + environment, and management + maintenance. 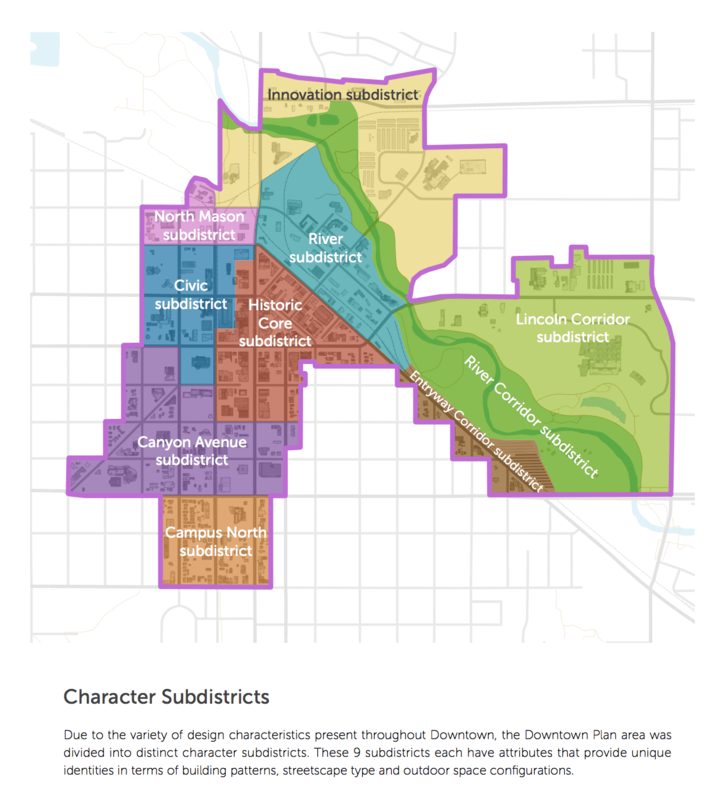 The Plan also breaks the downtown area into nine different subgroups based on the character that each area has already developed over time: the Innovation Subdistrict, the Poudre River Corridor, the River Subdistrict, the Lincoln Corridor, the North Mason Subdistrict, the Civic Subdistrict, the Canyon Avenue Subdistrict, the Historic Core, and the Campus North Subdistrict. Each of these subdistricts has a general character that has evolved naturally over time. The Plan seeks to leverage the value of these various character areas in order to not only maintain what makes these areas special and unique, but even to build upon and enhance that. So, for example, in the Innovation subdistrict, what characterizes the area is not so much the building styles, since most of the buildings in that area are fairly new, but the uses of those buildings. On the other hand, in the Campus North subdistrict, there’s a rather eclectic, bohemian type feel to the storefronts, many of which have simply been built right around the front of a house. So what might work really well in one subdistrict might look and feel very out of place in another. The Plan gives guidance on what the characteristics for each area are and how they can be strengthened and enhanced with future construction. An architect or developer that reads through the Plan might then realize that if they’re designing a new building in the Innovation subdistrict, they are free to explore new design styles, energy sources, parking strategies, or building materials. While the same architect or developer, if building in the Canyon Avenue subdistrict, will note that buildings should be set back from the sidewalk with a lawn or other landscaping between pedestrians and the building in keeping with the pattern in the area. The Urban Design section of the Plan includes information on how buildings should sit upon the lot, how tall buildings are allowed to be in various parts of the downtown area, and how those buildings should be sculpted in order to better fit in with surrounding buildings. It includes graphics like the one above that explain to the common reader what various terms mean. The most surprising element of the Urban Design section came out of a proforma study that the City conducted. By selecting some specific downtown lots and experimenting with various building shapes and designs, the staff members were able to determine how various Code requirements affected the viability of projects. They looked at requirements involving setbacks, stepbacks, plaza spaces, height restrictions, compatibility with historic properties, building materials, etc. and none of these things affected the size, shape, or feel of a building more than parking requirements. It became clear that City Code was setting a different standard for parking spaces than what the market would set if left to its own devices. During one open house that the City held, there was a board with a series of pictures on it of buildings constructed within the last 10 years. Attendees were asked to pick out the buildings that they felt “fit” in downtown Fort Collins. Of all the buildings, and there were several, the only one that the folks at my table felt had that feeling that it belonged was Odell Brewing’s new building. Their use of stone, and the overall style of the building, has a Fort Collins feel, according to the people in my group. And from talking to one of the City staff after that meeting, it sounds like most of the other tables had a similar difficulty picking out more than a few buildings that really felt like they belonged. There’s clearly something driving building design that’s leading to properties that most folks don’t really like. There wasn’t really an outcry against the buildings at the meeting so much as a very lackadaisical feel towards most of them, and some sense of distaste. Buildings are designed within a budget. When there’s a requirement from the City to include something that’s not driven by the market, then that’s a cost that the developer has to eat… and the reality is that the cost eats into the level of design, the type of materials, the allowance of setbacks, etc. that would help a building to fit in better in the given location. In other words, because we demand a certain amount of parking per building, we’re getting some blah buildings that no one really likes. So the Plan recommends a change in the Code that would allow the market to set the number of parking spaces required and that would encourage alternatives such a bike share and car share programs as well as structured parking throughout the downtown area. Each section of the Downtown Plan ends with specific action items that should be taken in order to help reach the goals that have been outlined in that chapter. Some have to do with updating the Land Use Code. Others list areas that could use further study. And still others basically encourage the City to keep on keeping on with programs that are already helping to create the future that we’d like to see Downtown. Even if you haven’t given input thus far in the process, it’s not too late to add your two cents into the discussion. The draft edition of the Plan is online. You can also share your comments on the plan through the City website. The Plan will be going before the City Council in February of 2017 for final approval. You might be rolling your eyes and thinking, “Right. I’m going to sit down and read some dull, dry, boring City document? Not likely.” But I think if you take the time to sit back, grab a beer, and flip through the pages, you’d find that it’s actually quite readable, and at points even interesting. It is, after all, about our city. And it focuses on a part of the city that many of us connect to as being the heart of our community. Not only is it worthwhile to get involved, but I’d be willing to bet that you might actually find yourself enjoying large sections of this document. The Midtown Plan was adopted in 2013. The West Central Area Plan was completed in 2015.